6th April 2019 St Ives NCI watch station assisted Falmouth Coastguard on Friday when an 18ft.sailing yacht experienced engine difficulties. Having received a 999 call HM Coastguard contacted the NCI watch station at St Ives to ask for further details and observations on the casualty. Helen Simpson, St Ives Station Manager, was on duty at the time and was able to give detailed information and provide regular updates to HM Coastguard regarding the incident, which spanned over 2 hours. Having securely attached themselves to a mooring buoy in the bay the yacht decided to cast off and again experienced engine difficulties, sending a further 999 call to the coastguard. 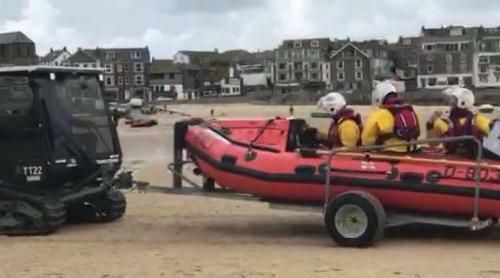 The tender to one of the local trip boats went to assist the yacht until the St Ives inshore lifeboat arrived. The two casualties were safely taken ashore, and the sailing yacht was finally taken to Hayle harbour on Monday by a local Hayle boat.